Gas gangrene is a necrotic infection of soft tissue associated with high mortality rates. We report a case of postoperative gas gangrene with very acute onset and rapid progression of symptoms. To our knowledge, this case is the most acute onset of postoperative gas gangrene ever reported. 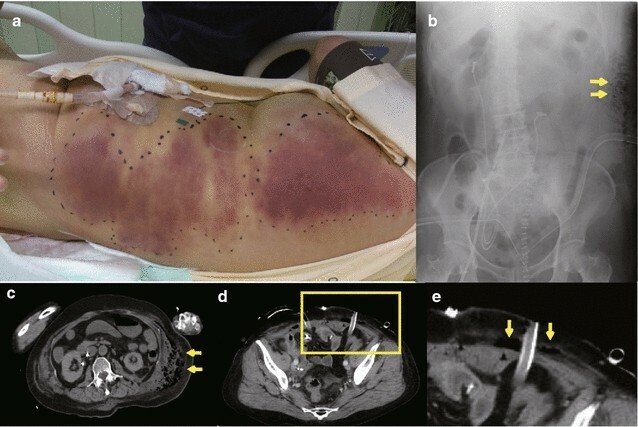 A 65-year-old Japanese female patient developed a shock state 16 h after radical cystectomy with ileal conduit reconstruction. Two days after the operation, she was transferred to the intensive care unit because of deterioration in her respiratory and circulatory condition. Soon after moving her to the ICU, a subcutaneous hemorrhage-like skin rash appeared and extended rapidly over her left side. Blood tests performed on admission to the ICU indicated severe metabolic acidosis, liver and renal dysfunction, and signs of disseminated intravascular coagulation. Suspecting necrotizing fasciitis or gas gangrene, we performed emergency fasciotomy. Subsequently, multidisciplinary treatment, including empirical therapy using multiple antibiotics, mechanical ventilation, hyperbaric oxygen therapy, polymyxin B-immobilized fiber column direct hemoperfusion, and continuous hemodiafiltration, was commenced. Culture of the debris from a wound abscess removed by emergency fasciotomy detected the presence of Clostridium perfringens. We hypothesized that the source of infection in this case may have been the ileum used for bladder reconstruction. Although the initial treatment prevented further clinical deterioration, she developed secondary infection from the 3rd week onward, due to infection with multiple pathogenic bacteria. Despite prompt diagnosis and intensive therapy, the patient died 38 days after the operation. Although the patient did not have any specific risk factors for postsurgical infection, she developed a shock state only 16 h after surgery due to gas gangrene. Our experience highlights the fact that physicians should be aware that any patient could possibly develop gas gangrene postoperatively. Gas gangrene is a rare and deadly infection that progresses very rapidly. Although it is usually caused by traumatic injury, it can also occur after surgery [1–5]. While the timing of symptom onset varies among cases, it occurred at least 24 h after surgery in previous reports. Here, we report a case of gas gangrene in which the clinical symptoms of sepsis appeared 16 h after urologic surgery. Although primary care was effective in this case, the patient died 38 days after the surgery. To our knowledge, this case represents the most acute onset of postoperative gas gangrene ever reported. A 65-year-old woman was diagnosed with bladder cancer 6 years earlier, for which she had undergone transurethral resection six times. Oophorectomy for a right ovarian cyst and total hysterectomy for endometriosis had been performed under general anesthesia at the ages of 30 and 35 years, respectively. During the current surgery, she underwent radical cystectomy with creation of an ileal conduit and removal of pelvic lymph nodes. Her past history of multiple laparotomies resulted in intestinal adhesions and massive intraoperative bleeding. The total blood loss during surgery was 5340 ml. She received 1200 ml of autologous blood transfusion, and subsequent transfusion of 560 ml of red cell concentrates and 1200 ml of fresh-frozen plasma in the operation room. The surgical time was 6 h and 49 min. Administration of the antibiotic isepamicin (ISP: 200 mg) was started to treat a fever of 40 °C immediately after moving her to the ward. However, she developed a shock state 16 h after the operation (Fig. 1). Her systolic blood pressure decreased to approximately 70 mmHg and urine output was less than 25 ml/h. Infusions of Ringer’s solution, albumin preparations, immunoglobulins, and vasopressors were started because we suspected septic shock. Administration of imipenem/cilastatin sodium (IPM/CS: 500 mg) was added to ISP because we thought that more intensive empiric antimicrobial therapy was necessary. Two days after the operation, she was transferred to the intensive care unit (ICU) because of deterioration in her respiratory and circulatory condition. Soon after moving her to the ICU, a subcutaneous hemorrhage-like skin rash appeared and extended rapidly over her left side (Fig. 2a). On admission to the ICU, blood tests indicated severe metabolic acidosis, liver and renal dysfunction, and signs of disseminated intravascular coagulation (DIC) (Table 1). Her APACHE II (Acute physiology and chronic health evaluation) and SOFA (Sequential organ failure assessment) scores at this time were 24 and 14, respectively. An X-ray examination and computed tomography (CT), which was performed on postoperative day 2, indicated uninterrupted massive emphysematous tissue from her left chest to lower abdomen (Fig. 2b, c). Suspecting necrotizing fasciitis or gas gangrene, we performed emergency fasciotomy. Subsequently, multidisciplinary treatment, including mechanical ventilation, hyperbaric oxygen therapy (HBOT), polymyxin B-immobilized fiber column direct hemoperfusion (PMX-DHP), and continuous hemodiafiltration (CHDF), was started. Antibiotic therapy was changed to clindamycin (CLDM: 900 mg), vancomycin (VCM: 1000 mg), and IPM/CS (Fig. 3). Gram-positive bacilli, but not Gram-negative bacteria, were detected by microscopic examination of blister fluid aspirated from the skin rash. Moreover, a culture test detected Clostridium perfringens (C. perfringens) in a wound abscess that was removed during the emergency fasciotomy. Based on these observations, she was diagnosed with gas gangrene. HBOT was performed on the first and second ICU days. We had to abandon plans for a second fasciotomy because the area that required treatment was too large. CHDF was continued through her ICU stay, although PMX-DMP was performed only once on the first ICU day. Her APACHE II and SOFA scores continued to be flat during the first 2 weeks, indicating that the initial treatment prevented further clinical deterioration (Fig. 3). However, she suffered from secondary infection from the 3rd week onward due to infection with multiple pathogenic bacteria, including Candida albicans and Pseudomonas aeruginosa, as shown in Table 2. Finally, she died of sepsis 38 days after the operation in spite of prompt diagnosis and intensive therapy for the gas gangrene. Here, we report a fatal case of postoperative gas gangrene with very acute onset and rapid progression of the symptoms. This case report especially focuses on the risk factors, cause of infection, and treatment methods of postoperative gas gangrene. Gas gangrene used to be frequent during war times, being related to weapon injuries . In modern clinical practice, the various causes of gas gangrene have included “sterile” operations, intravenous infusion, intramuscular injection, and criminal abortion, etc. . Even if a patient does not have any evident infectious causes, recent abdominal surgical intervention can also contribute to gas gangrene formation. Indeed, several cases of gas gangrene with C. perfringens after abdominal surgery have been recently reported [2, 3]. The onset of symptoms in these cases was 2 weeks and 2 days after the operation, respectively. To our knowledge, our case represents the most acute onset of postoperative gas gangrene with C. perfringens ever reported. It is well known that both the existence of cancer cells and exposure to anesthetic agents can suppress the immune system, which in turn increases the risk of surgical site infection . In addition, gas gangrene occurs more frequently in diabetics, alcoholics, immunosuppressed patients, IV drug users, and patients with peripheral vascular disease . The risk of postoperative infection in our case may have been increased by the long operation and massive blood transfusion . However, the patient had a past history of exposure to neither anticancer nor immunosuppressive agents. Moreover, she did not have any preexisting co-morbidities other than hyperthyroidism. Hence, she was not considered to have a particularly high risk for development of postoperative gas gangrene. Thus, the cause of fulminant infection with C. perfringens in this patient with no remarkable risk factors is unknown. Molecular typing of toxins and enzymes involved in the virulence of C. perfringens seems to be a powerful tool to clarify this issue. However, we did not assess the toxins and enzymes, which is a limitation of this case report. We hypothesized that the source of infection in this case might have been the ileum used for bladder reconstruction. Urinary diversion via the bowel might contribute to contamination by bowel microbes . In general, two conditions are necessary for the onset of gas gangrene: (1) the presence of clostridial spores, and (2) an area of tissue hypoperfusion caused by circulatory failure in a local area or by extensive soft tissue damage and necrotic muscle tissue. The occurrence of clostridial species in feces is not rare, a large number of clostridia having been found to be present in normal human feces (106–109/g feces) . In particular, C. perfringens was reportedly detected in 33 % of healthy Japanese adults, and at a concentration of at least 103/g feces . These indicate that endogenous clostridial spores that probably existed in her ileum may have spread into the surgical wound. Abdominal enhanced CT images obtained 1 day after the operation (Fig. 2d, e) showed the presence of air-densities between the subcutaneous fat tissue and muscle layer in the vicinity of the drainage tubes. These CT images support our hypothesis that the drainage tube might have been the source of the C. perfringens infection. Urgent surgical exploration and debridement of devitalized tissue are crucial for the treatment of gas gangrene. In addition, aggressive antibiotic treatment is also important. The first choice of antibiotics for Clostridium is penicillin . However, we could not use penicillin because she had developed hypersensitivity responses to penicillin with shock at the age of approximately 20 years. Hence, we used IPM/CS and CLDM, which are considered the second choice for Clostridium. It was recently reported that CLDM resistant C. perfringens species are on the increase . In this case, CLDM resistant C. perfringens was detected in the wound abscess. Therefore, we had to discontinue use of CLDM. Although C. perfringens was abolished by our intensive therapy, multidrug-resistant Pseudomonas aeruginosa caused multi-organ failure and, ultimately, death. Similar to what has been seen in many cases of severe sepsis, the secondary infection was likely due to a combination of neutropenia and an adverse reaction to broad spectrum antibiotics. Despite remarkable progress of multidisciplinary therapeutic methods, including extensive surgical debridement, antibiotic coverage and HBOT, the morbidity and mortality rates of gas gangrene are still very high (up to 57 %) [13, 14]. Given this high mortality rate of gas gangrene, physicians should be aware that any patient could possibly develop gas gangrene after an operation. TT and TH wrote the manuscript. JO, HH, FK, and SS treated the patient. FK and SS revised and edited the manuscript. All authors read and approved the final manuscript. We would like to thank Dr. Jiro Kamiyama for the helpful discussions. Before the surgery, the patient gave consent for possible publication of her case report and any accompanying images if it should be necessary. In addition, we got consent for publication from her husband and son after her in-hospital death. Contributions to funding this manuscript were obtained from the Japan Society for the Promotion of Science, Grant-in-Aid for Scientific Research, 15K10533.